This anthology is made up of the following works: Logan the Mingo by Franklin B. Sawvel, Tah-Gah-Jute, or Logan and Captain Michael Cresap by Brantz Mayer, and Chief Logan: Friend, Foe or Fiction? by Ronald R. Wenning. 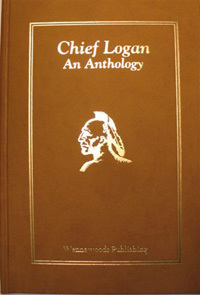 Sawvel's work was originally published in 1921 and represents the first attempt at a full and complete biography of Chief Logan. The selection from Mayer was originally published in 1851 as the proceedings of a lecture delivered before the Maryland Historical Society, and includes a selection of letters by Gen. George Rogers Clark and others concerning Logan. This selection also includes six versions of the famous speech given by Chief Logan which are among the most famous words ever spoken by an American Indian. The final selection is an essay by Ronald Wenning which draws together several bits of information about Logan from a variety of sources. 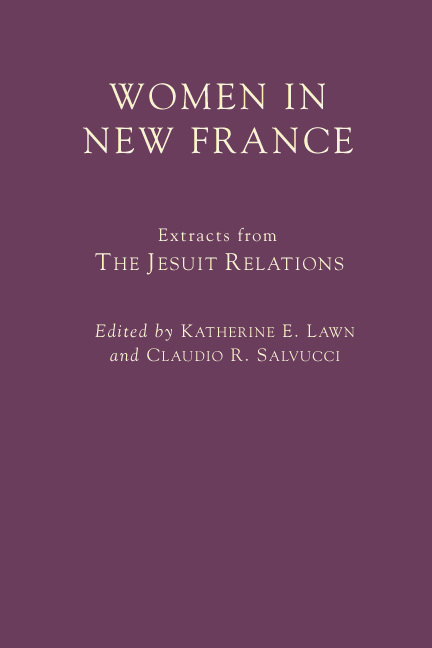 Volume 5 presents extracts from the Jesuit Relations that record first-hand observations made by the Jesuit fathers in New France regarding the roles, traditions, words, and actions of both Native American and colonial European women from 1634 to 1790. Together, these extracts present a vivid, poignant, and emotional portrait of the lives and deaths of women in early colonial North America. To best illustrate the differing roles and changing circumstances affecting women in this historical setting, the extracts are organized chronologically according to tribal, ethnic, and settlement groupings. Covered in detail are the Montagnais, the various Algonquin nations, the Hurons, Iroquois and Iroquoian-speaking nations (Petun, Neutrals, Eries, and Wenro). Extracts covering the tribes of the lower Mississippi (Houmas, Chickasaw, Natchez, etc.) and the plains (Sioux and Akensas) are also included. Finally, several chapters include extracts dealing with the lives of colonial French women, Catholic nuns, and both native and European women’s lives in the mission towns. An introduction written by the editors helps place the extracts in their historical and cultural context and a bibliography of related reading is included. A map of tribal territories and movements from 1600–1700 is provided, as well as useful appendices, including: A synonymy of obscure tribal names contained in the extracts and an index of principle persons mentioned in the extracts. This history, written in 1895, gives a brief account of the country of the Neutral tribe, who occupied numerous villages between the Grand and Niagara Rivers in southern Ontario. Contact population for the entire Neutral nation was estimated to be 30-40,000, making them perhaps more numerous than all of the five nations of the Iroquois nations combined. They were termed "Neutrals" because they historically did not take sides in the ongoing wars between their neighbors the Iroquois and the Hurons. The Neutrals themselves were attacked and scattered by the Iroquois in the early 1650s, leaving hardly a trace of their language, history, and culture save what was recorded by the few missionaries that visited them beforehand. After their reduction by the Iroquois, the remnants of the Neutral tribes seem to have been absorbed by the Iroquois or coalesced with refugees of the Petún and Hurons to form the Wyandot tribe. 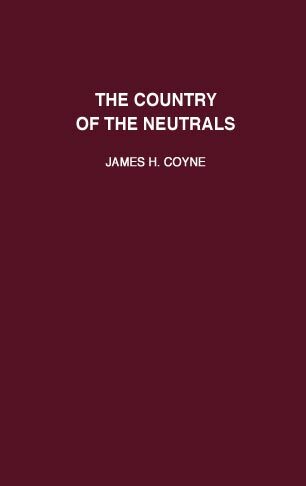 This book consolidates accounts of the Neutrals recorded by early explorers and missionaries such as Champlain, De Laroche-Daillon, Sagard, Brebéuf, Chaumonot, and others. Together, these accounts provide an absorbing if fragmentary view of this once great tribe. This book also covers the subsequent inhabitants of the Neutral country: the Iroquois, French, Delawares, Mohawks, and English up through the beginning of the 19th century. The book contains a short preface detailing the original source of the work, is produced in a handy small-format (4.25" x 6.75"), and features a durable library binding and acid-free paper. David Zeisberger was a Moravian missionary who worked among the Indians of present-day New York, Pennsylvania, and Ohio. His career lasted more than 60 years and during that time, he became intimately familiar with the tribes of the region. This book brings to light many interesting stories of Indian history, manners, and customs of everyday life. This exceptionally detailed account is found in few other places in the early literature. Included are stories of Indian medicinal remedies, firsthand details of their ceremonies, food, culture and beliefs. Tribes discussed include the Delawares, Shawnee, Iroquois, Cherokee, Nanticokes, and many others. American historian Henry Trumbull stamped Tecumseh as “the most extraordinary Indian that has appeared in history,” and today, almost two centuries after his death, Tecumseh still looms as the greatest native leader in the long and tragic struggle of the American Indians to hold on to their homeland. Written in 1841 and published in 1855, this book describes the story of that great leader and his people and their struggle with life and their pursuit of an Indian homelands fairly and accurately. Using many original sources, including General Harrison’s personal papers, Drake brings Tecumseh and the Shawnee vividly to life once more. Perhaps no state is richer in Indian names or history than Pennsylvania. Indeed, Indian place names are positively everywhere--Manayunk, Conshohocken, Kittatinny, Wisahickon, Lackawana, Perkiomen, Monongahela, Allegheny, etc. This book links PA Indian place names to their correct form, origin, and history. Each Indian name comes complete with historical notes by the author. A list of the authorities used is given with each name and a general bibliography follows at the conclusion of the work.